Proteinkinase.biz, Biaffin's online shop, supplies reagents, recombinant proteins and services for kinase research and exploring cellular signaling pathways. Please select your product category of interest! 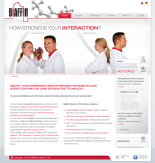 BIAFFIN is distributor of products from ACRObiosystems and AXON Medchem. ACRObiosystems is manufacturer of recombinant proteins and antibodies. AXON Medchem is a prime source of life science products for pharmaceutical research. Proteinkinase.biz is the online shop and distribution platform of Biaffin GmbH & Co KG supplying research tools for kinase research and exploring cellular signaling pathways. Our range of products comprises recombinant proteins (protein kinases, phosphatases, cytokines), kinase and phosphatase inhibitors, substrates, kinase and phospho-specific antibodies and bioluminescence assays for quantification of cellular ATP concentrations. All our products are intended for in vitro research use and can be delivered to academic and business customers with adequate skills and professional background only. We do not supply private customers! Biaffin is a biotech company located in Kassel (Germany) specialised in providing analytical services for kinetic validation of any pair of interacting molecules using biosensors based on surface plasmon resonance (SPR, Biacore). Our range of services includes performance of biochemical and enzymatic assays and assay development for medium to high throughput binding assays based on bioluminescence, microfluidic mobility shift, SPR or FP. Our KINASCREENTM service provides you detailed kinetic analysis of small molecule inhibitors binding to protein kinases using Surface Plasmone Resonance (SPR). Please contact us for questions about an order or our products or to get more information about Biaffin analytical services.